>Splendid 0.78" OLED Touchscreen 128 x 80 Screen Resolution, Slide and Press, Smooth and Easy. 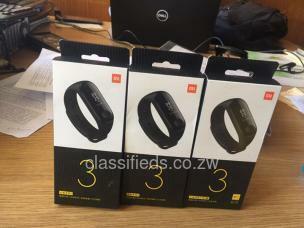 Swimming Wristband Bracelets: Featured with 5ATM Water Resistance technology, Xiaomi Mi Band 3 can work well 50m under water, deeper than most similar fitness trackers and smart watches in the market can handle, which fulfill all your daily routines, you don’t need to worry when taking shower, washing, running in the rain, swimming and surfing. With creative added screen sports mode design, you can check data, even during exercises, simply by lifting your arm, without complicated actions of checking the app on your phone. You can adjust your sports mode in time after detailed statistics analysis, such as distance measuring, speed calculating, pace tracking, real-time heart rate monitoring etc. 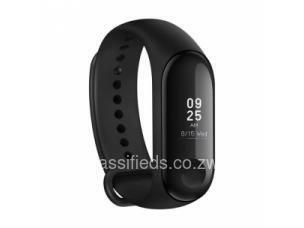 In addition to vibrating on wrist when your phone receives calls, messages or other notifications such as from Facebook, Twitter, Snapchat, WhatsApp and WeChat, it displays details on the screen directly, such as readable content of massage and name or ID of the caller etc. With firmly lock chips, Mi Band 3 is not easy to lose (the two-color synthesis process has passed 2000 disassembly tests and is still firm and reliable). Mi Band 3 can show caller name and ID directly on the screen. If there is a call coming during meeting or lesson, instead of taking your phone out to reject the call, you can easily press the button and hold for a while to reject. When you are too busy and forget the time, the band will gently vibrate, remind you to get up and walk. Maintain a better physical condition, stay focused yet relax appropriately. 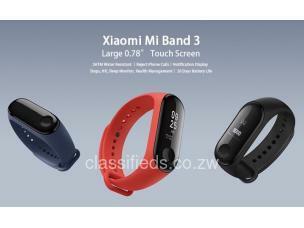 With 110mAh battery capacity, Mi Band 3 can last for nearly 20 days with normal usage. It can support for Bluetooth 4.0 and above, Android 4.4 and above, and iOS 9.0 and above, including most smart phones in marketing.